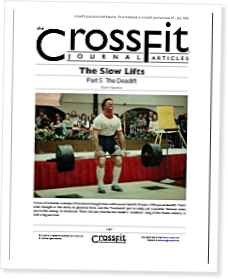 There is no more functional movement than picking up something heavy, as we do in the deadlift, writes Mark Rippetoe of The Witchita Falls Athletic Club/CrossFit Witchita Falls in part 5 of his series on the slow lifts. The deadlift is one of the things our bodies are built to do. By practicing, we gain proficiency at movements we are frequently called on to perform in nature. The low back arch is not natural for some people, and it must be worked on and coached diligently if it is not right. The upper back, “chest-up” position can cause problems with our other main consideration, the bar path, if it is not understood clearly. The chest-up position has nothing to do with the back angle. The chest can be lifted by the thoracic contraction in any position, standing straight up or bent over at the waist. So can the lower back extension, the movement that tightens the muscles that protect the lumbar spine. This skill needs to be developed so that a tight back position can be assumed whenever it is necessary, in any position, whether deadlifting or picking up the groceries. Bill Starr explains how to plan strength work for maximum gains. Chris Mason offers a program designed for CrossFitters who want to improve their deadlifts without compromising overall fitness. "I swear that I actually saw a guy doing 50-pound behind-the-neck lat pulldowns while seated on a Swiss ball." In repose to the above comment, I'm sure you wanted to smack some sense into that guy. I know I would have. Some people just don't think!